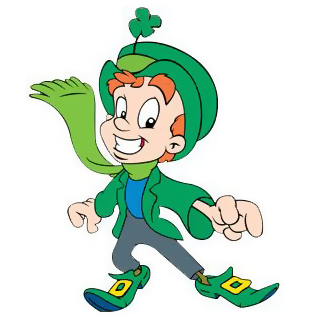 Probably the most famous leprechaun is Lucky the Leprechaun from the Lucky Charms cereal boxes. He is adorable and always smiling and happy. 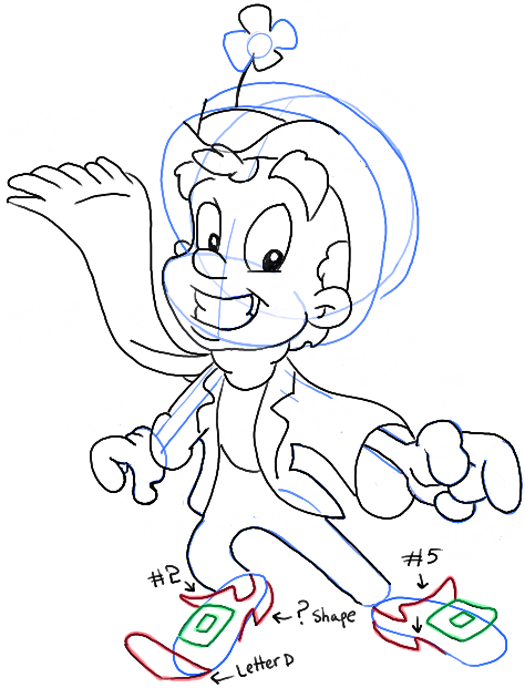 Since Saint Patricks Day is coming up, I figured that it would be a great time to show you how to draw Lucky the Leprechaun. 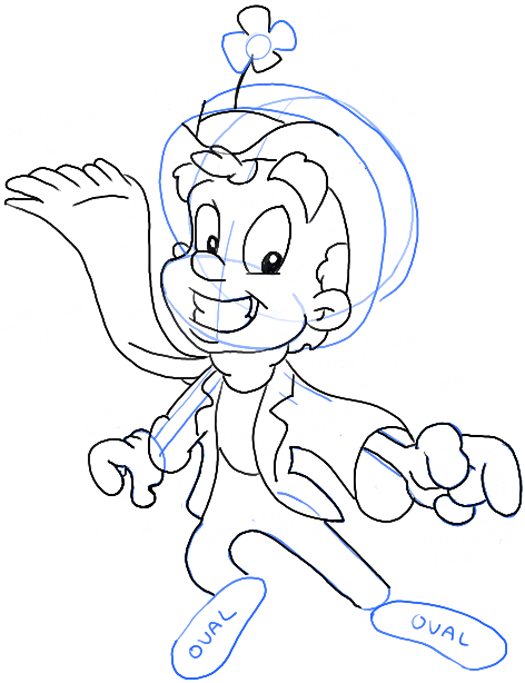 Below you will find a step by step drawing tutorial for drawing the Lucky Charms leprechaun. Have fun! 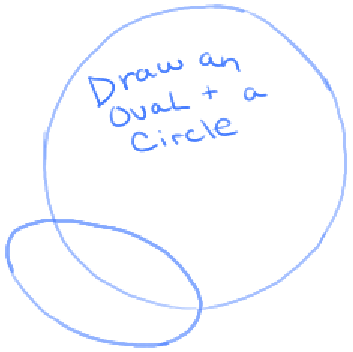 Lightly draw a circle and an oval. – Lightly draw a guidelines thru the face. – Draw a capital letter ‘E’ shape for the mouth. – Draw a backwards letter ‘C’ shape for the ear. – Draw a letter ‘C’ shape for the nose. Draw a line next to it for the bottom of the right eye. – Draw a letter ‘s’ shape for the left side of the face. – Draw upside letter ‘u’ shapes for the tops of the eyes. 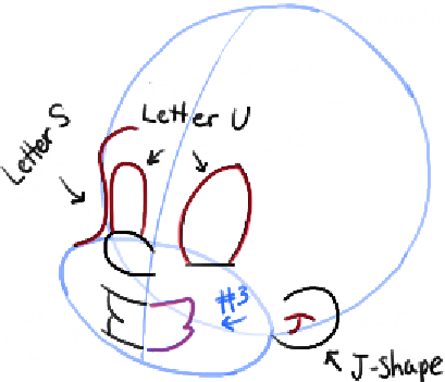 – Draw a letter ‘J’ shape inside the ear. – Draw a #3-like shape for the right-side of the mouth. – Draw #3-like shapes on the head. – Draw a letter ‘T’ shape on the right side of the mouth. – Draw 2 curved lines under the mouth. 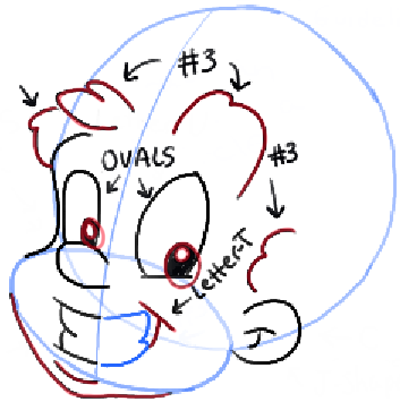 – Draw 2 ovals inside each eye. 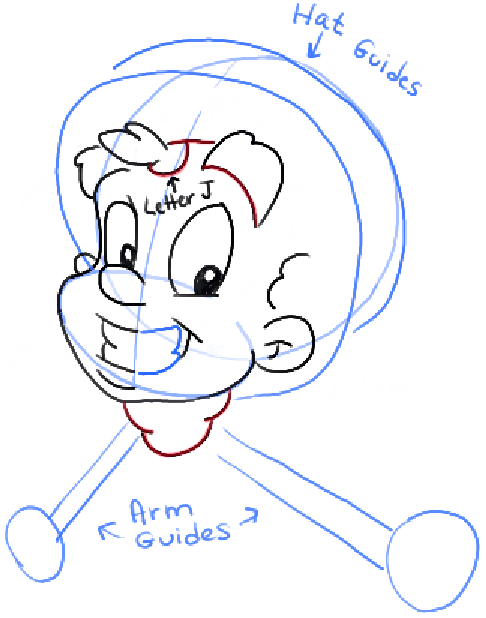 – Draw 2 lines for each arm and an oval on the ends of each of them. – Draw 3 curved lines under the chin. 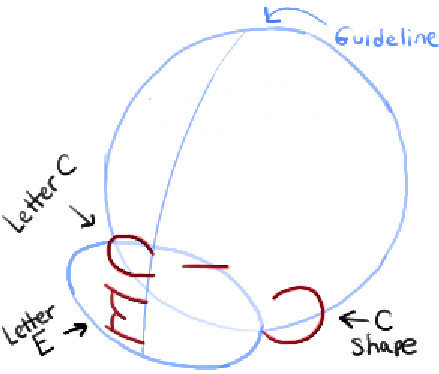 – Draw curved lines for the hat’s guidelines. – Draw a capital letter ‘J’ shape on the forehead. Draw a curved line under the right eye brow. 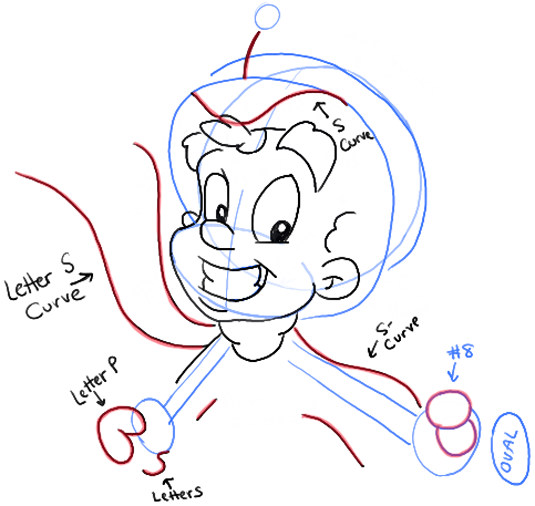 – Draw a curved line on top of the head. – Draw a capital letter ‘P’ shape and a letter ‘s’ shape on the left hand. – Draw a #8-like shape and an oval on the right hand. – Draw letter ‘J’ or ‘U’ shaped humps on the left end of the scarf. 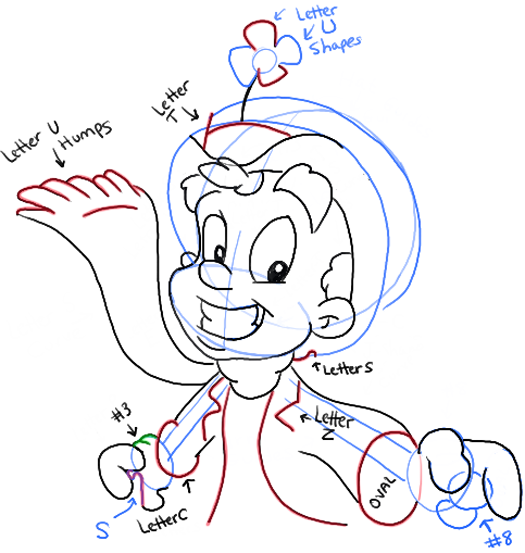 – Draw a circle with letter ‘U’ shapes around it for the 4-leaf clover on top of his hat. – Draw a sideways letter ‘T’ shape on his head. – Draw a sideways ?-like or letter ‘s’-like shape on the right-bottom side of head. – Draw a letter ‘z’ shape on the right side of coat and a #3-like shape on the left side of coat. – Draw a few more basic shapes as seen in picture. 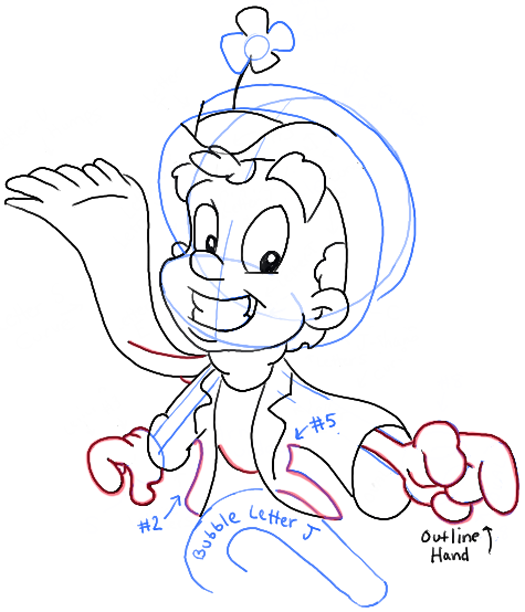 – Outline hands using guides that you drew in previous steps. – Draw a #2-like shape and a #5-like shape on the coat….as well as a curved line. – Draw a bubble-letter ‘J’ shape for the legs. – Draw ovals for the guides to the feet. – Left Foot: Draw a #2-like shape, a ?-like shape, a capital letter ‘D’ shape, as well as 2 rectangles. – Right Foot: Draw two #5-like shapes as well as 2 rectangles. – Left Foot: Draw a letter ‘T’ like shape as well as a few lines. – Right Foot: Draw 2 inwards curved lines for the left sticking out of the shoe at the top. Draw a #9-like shape as well as a letter ‘j’ shape. Now erase any guidelines that are left over then darken or thicken any lines that need it. 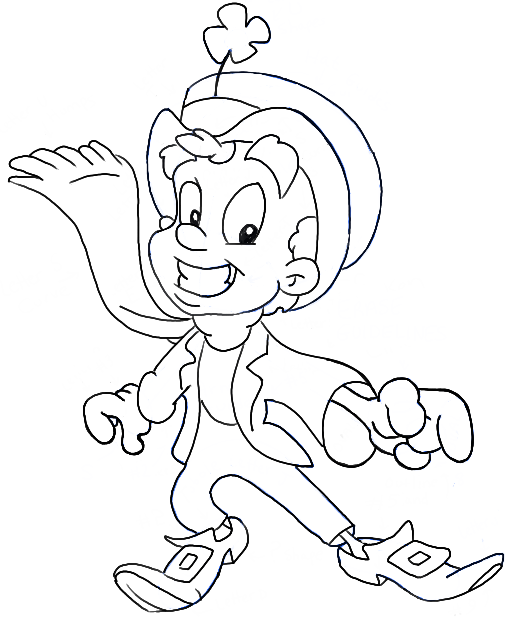 You now have a great drawing of the Leprechaun from the Lucky Charms boxes. I hope yours turned out great! This is what the little guy looks like colored in. Have fun! 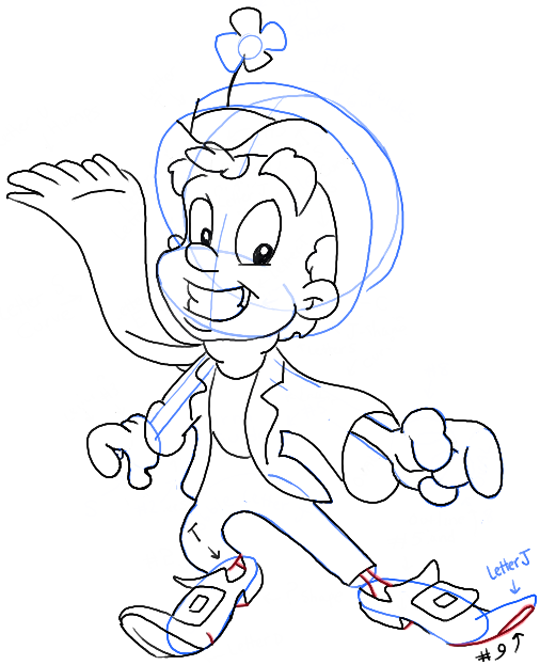 I could draw this guy with out instructions i just look at a character and draw. This article was written on 07 Mar 2014, and is filled under Holidays, Logos and Brands, Saint Patricks Day.